It may have been 45 degrees outside but it’s the beginning of April; it’s time to fire up the grill! My buddy and I were starving so we headed off to the grocery store and decided on brats. 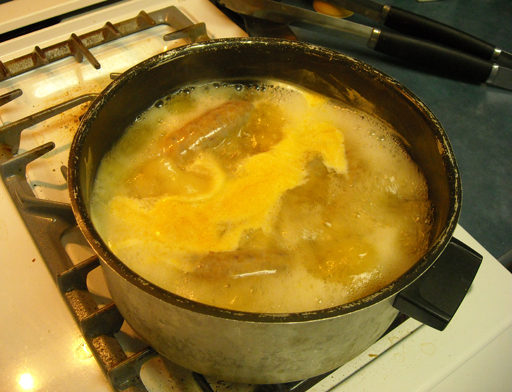 We started out by boiling them in beer. Normally, I would have chosen a dark beer such as Shiner Bock, but instead we opted to use Budweiser as we wanted a silghtly lighter flavor (and we had more Bud than Shiner). We came up with two different brats. 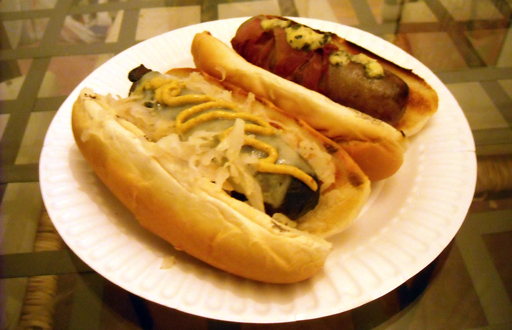 The first was a bacon wrapped brat with melted provolone cheese, spicy brown mustard and sauerkraut. The second was a prosciutto wrapped brat with melted blue cheese. For added texture we served them on toasted french bread instead of regular hot dog buns! The prosciutto was perfectly cooked, nice and crispy and combined with blue cheese was fantastic. Overall it was a great night of grilling, enjoy!